This is one of five nunneries in Via dei Monasteri: see the page on Nunneries in Via dei Monasteri for the other four. The earliest surviving record of the Monastero di Sant’ Anna (to the left of the later church in the illustration above) is in a will of 1394, in which it is referred to as the Monastero delle Contesse, no doubt because of the noble extraction of its inhabitants. The will also records that it had been founded by the Blessed Paoluccio de' Trinci. He sponsored a community of women who lived here as Franciscan tertiaries and worshiped at San Francesco. They chose their spiritual advisers from the reform-minded friars: from 1415 these came from San Bartolomeo di Marano. 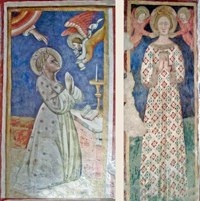 One of the original women at Sant' Anna was Francesca. the daughter of Giacomo di Binolo da Montegiove and widow of Trincia di Rinalduccio de' Trinci. When her two brothers died during an epidemic of plague in 1394, she was joined by Blessed Angelina da Montegiove, her only surviving sibling, who was then aged about 40. Angelina is first recorded as a "professa" of the community in a will dated 1400 and subsequently became its leader. Although similar lay communities were springing up across central Italy, their status was unclear because the sisters did not observe clausura. However, Angelina secured approval of the way of life of the sisters at Sant' Anna from Pope Boniface IX in 1403, no doubt helped by her Trinci relatives. Life became difficult for Angelina in 1430 when the Observant Franciscans of Foligno imposed strict enclosure on the Congregation, a move that she was unable to resist. She was deposed for a short period but was able to resume her post after she formally revoked the obedience that she had promised to the Franciscan Order. Angelina died in 1435 and was buried in San Francesco (as was usual for the sisters at Sant' Anna). The Congregation that she had founded was dissolved in 1461, and Sant’ Anna continued as an independent foundation. Suor Dania, who had joined Sant’ Anna after the death of her husband, Giovanni Crispolti, established the Monastero di Santa Caterina, Bettona in 1439. The conflict with the Observant Franciscans over clausura intensified in 1484 and the Commune was forced to intervene. They invited a community of Amadeiti Fathers to come to the city in order to assume spiritual responsibility for Sant' Anna and gave them the complex at San Feliciano di Mormonzone, near Sant' Eraclio. The arrangement seems to have lasted until ca. 1520, when the sisters were once more subjected to the Observants. They nevertheless managed to avoid clausura until 1615,when the papacy imposed on all monasteries of women. (This restriction was finally lifted in 1903). The most important member of the community in the 16th century was probably Sister Anna de’ Conti, who was recorded as the “Ministra” of the community in 1557 and again in 1578. She was the niece of the papal secretary, Sigismondo de' Conti and a considerable heiress. Much of the expansion and decoration of the nunnery in the 16th century derives from her largesse. 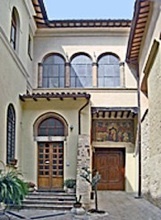 For example, the nuns acquired the so-called Casa di Nicolò Alunno in ca. 1549 and converted into the infirmary. Sister Anna de’ Conti inherited the Madonna di Foligno (ca. 1511), which her uncle, Sigismondo de' Conti had commissioned from Raphael for the high altar of Santa Maria in Aracoeli, Rome. She arranged for the altarpiece to Sant' Anna in 1565. It was initially in the nuns' choir but was moved later in the 16th century to the high altar of their external church. (For more details see "Art from the Complex" below). In 1915, Sant’ Anna became the mother-house of the restructured Congregation of Franciscan Tertiary Sisters of the Blessed Angelina. It is possible to stay in their guest wing (which is in the Casa dell' Alunno), details of which are in their website. Alternatively, ring 0742 342 688 to arrange a visit, which includes the three rooms in the Casa dell' Alunno that contain the artist's frescoes and graffiti. The Madonna di Foligno made a temporary but hugely popular return to Sant’ Anna in January 2014. The nuns’ first church was built in ca. 1407 and consecrated (according to a record that no longer survives) in 1419. It probably stood on the site of their present church, to the right of the entrance to the nunnery. It was extensively restored in the late 16th century and essentially rebuilt (in the form illustrated at the top of this page) in 1729. The interior took on its present appearance after a further restoration in 1910 by Ugo Scaramucci. This panel on the high altar depicts God the Father with the Blessed Angelina and SS Bonaventure, John of Capestrano and Paschal Baylon. It might have been moved here in ca. 1800, after the French confiscated the Madonna di Foligno by Raphael (see “Art from the Complex” below). 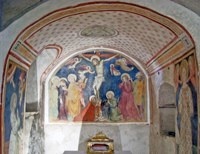 This fresco in the vault was executed by Ugo Scaramucci during his restoration of the interior. 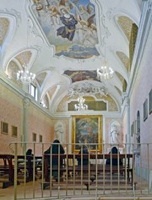 This fresco, which is attributed to Pierantonio Mezzastris, is above the entrance to the nunnery (on the right in the illustration above). It was financed from the will (1481) of Elena, the widow of Filippo di Ser Andrea Varini. It depicts the Madonna and Child enthroned with St Anne and the Blessed Angelina, below a cornice with angels throwing flower petals. Unfortunately, the lower part has been lost. The door on the right in the photograph of the entrance courtyard above leads to the first cloister. It contains a series of monochrome frescoes that were apparently painted in three phases (see the reference below). This fresco above the entrance from the courtyard has the date inscribed as graffiti on the fictive column to the right. It is attributed to Andrea d' Assisi, l' Ingegno. ✴scenes from the life of Christ. Note the unusual iconography used in the Circumcision of Jesus, in which the Virgin and her companions (rather than a priest) perform the operation. These frescoes depict scenes from the later life and the Passion of Christ. The Rampeschi arms appear under the scene of the resurrection: these probably belonged to Sister Maria di Giovanni Pietro de’ Rampeschi, who was documented at Sant’ Anna in 1573. 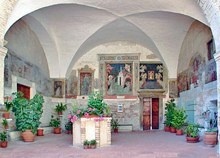 These frescoes are attributed to Camillo Angelucci da Mevale. This fresco to the right of those above, which is attributed to Pierantonio Mezzastris, is dated by an inscription on the campanile of the chapel. This fresco over the portal is attributed to Lattanzio di Nicolo. This is the oldest part of the nunnery. ✴St John the Evangelist to the right. The soldier at the extreme right, who directs the viewer’s attention to the scene,is probably the Centurion who remarked: “Truly, this man is the son of God”. ✴The figure on the left, whom the hand of God selects to receive the sacraments from an angel, is usually thought to represent the Blessed Angelina. However, she was probably still alive when this fresco was painted and so is unlikely to have been the subject. In any case, the figure is depicted as a young woman who was already a saint. She might have been St Catherine of Siena, who died aged 33: she was not canonised until 1461, but the nuns of Sant' Anna might well have regarded her as a saint before that. ✴The figure on the left is usually thought to represent St Elizabeth of Hungary, the patron saint of Franciscan tertiaries, although she could alternatively be St Catherine of Alexandria. A document dated 1451 records that the sisters sold property at that time to finance the building of the refectory. ✴the marriage at Cana (on the back wall). This fresco, which is attributed to Giovanni di Corraduccio, is in the room leading to the refectory (to the right of the entrance). The choir was built in the 15th century and decorated mostly in the 16th century. The famous Madonna di Foligno by Raphael (see below) was on the altar wall here for a period from 1565. 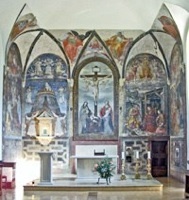 This fresco, which is to the right on the altar wall, is attributed to Dono Doni. It is dated by an inscription that also records the name of the donor, Finalteria de Meneco de Calamo de Bevagna. It depicts the Holy Family with St Lucy (a figure that was probably inserted at the request of the donor). This fresco, which is attributed to Nicolò Circignani, il Pomarancio, is on the right wall. It is dated by an inscription that also records the name of the donor, Bishop Bufalini, who made the donation for his niece. This was almost certainly Ventura Bufalini, who was Bishop of Massa in the decade from 1560: his niece Vitoria was a nun at Sant' Anna and the family were related to the de' Conti family. This fresco at the centre of the altar wall is signed “VIT ALE MGGI” (usually transcribed as Vitale Maggi, although no other work by an artist of this name is known) and dated by inscription. 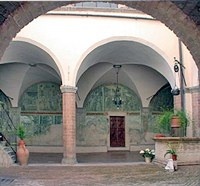 It was obviously commissioned after the Madonna di Foligno (see below) was moved from the altar here to the nuns’ external church. The fresco depicts the Crucifixion with the Virgin and SS Francis, Mary Magdalene and John the Evangelist and the Blessed Angelina da Montegiove. Sigismondo de' Conti, the Chamberlain to Pope Julius II, commissioned this altarpiece from Raphael for the high altar of Santa Maria in Aracoeli, Rome. He died soon after and was buried in the apse of that church. In 1565, his niece, Anna de' Conti arranged for the altarpiece to be moved to Sant' Anna. It was initially in the nuns' choir but was moved later in the 16th century to the high altar of their external church. The nuns resisted a series of offers to buy the painting over the centuries. It is surprising that the French did not earmark it for confiscation under the Treaty of Tolentino (1797). However, Napoleon's commissioner, Jean-Antoine Gros subsequently added it to the list, and the vociferous objections of the people of Foligno were to no avail. Antonio Canova recovered it in 1815. However, it became the subject of a dispute between the nuns of Sant' Anna and the canons of the Duomo, Foligno. The nuns therefore decided to sell it to Pope Pius VII. It is now in the Pinacoteca Vaticana. ✴A copy (17th century) that is attributed to Giuseppe Cesari, il Cavalier d’ Arpino formed part of the bequest by the heirs of the Roscioli family to the Duomo in 1703. It seems that either Bartolomeo or Giovanni Maria Roscioli commissioned it when the original altarpiece was in Sant’ Anna. It is now in the Museo Diocesano. ✴A copy (18th century) hangs on the wall of the apse of the Duomo. ✴A copy (1838), which is signed by Enrico Bartolomeo and dated by inscription, is now in the Pinacoteca Civica. The altarpiece depicts the Madonna and Child seated on a cloud in front of the sun; this may be a reference to the "woman clothed by the sun" in Revelations 12:1. ✴St Jerome commends the kneeling donor to the Virgin. Giorgio Vasari commented that the portrait of the donor was "as lifelike as any ever painted". ✴The kneeling St Francis commends the viewer to the baby Jesus. ✴St John the Baptist draws the viewer's attention to this apparition. The scene is set before a cityscape of Foligno. Sigismondo is thought to have commissioned the work in thanks for the survival of his palace in the city (now Palazzo Gentili Spinola - see Walk II) after it had been struck by a ball of lightening, and this event seems to be depicted here. The small angel in the centre of the composition holds a plaque that was probably intended originally to bear an inscription. This fresco, which is attributed to Feliciano de’ Muti, is now in the Pinacoteca Civica. It depicts the Madonna and Child enthroned with the young St John the Baptist and SS Francis and Antony of Padua.